This Braised Chicken with Olives, Capers and Prunes hits all the right notes! 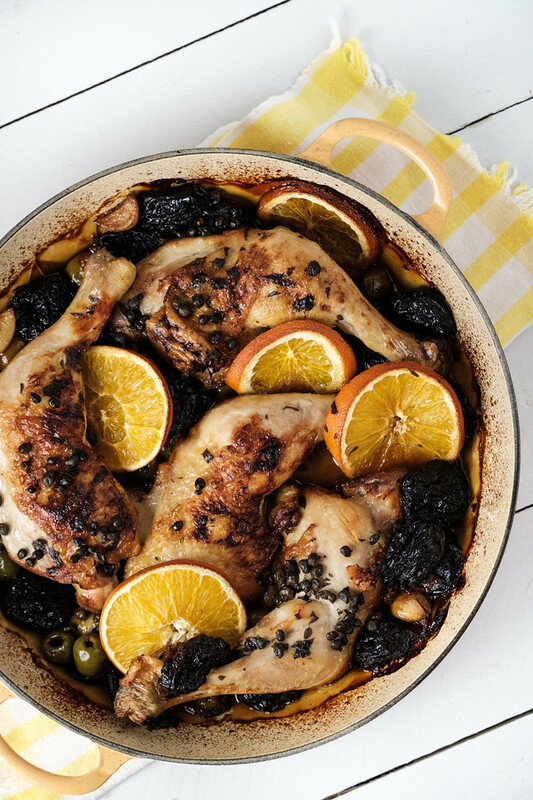 This easy braised chicken recipe is loaded with flavor from the olives, capers, prunes and orange slices! We loved it and leftovers the next day were even better! I love seasonal transitions, don’t you? It seems to me that the transitions are better than the actual seasons, at least when it comes to cooking. Right when you are getting tired of eating a certain way, along comes a a new season to change up your cooking. One of my favorite transitions is from summer to fall. I hate heat, so that has a lot to do with it, but I also love fall and winter cooking. Just when you think you can’t heat another salad, it’s time to do some heavier dishes. Braises are almost always my first transition dishes. They are so easy. There are basically two ways to braise and they typically both start with a browning on the stove and then a finishing on the stove or in the oven. My Braised Chicken Thighs with Wild Rice with Grapes braises on the stove. 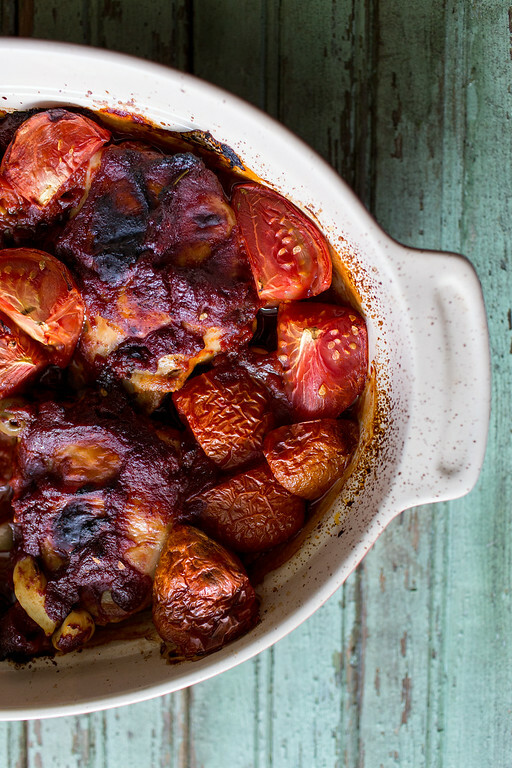 Today’s easy braising recipe, braises in the oven. As soon as I saw this in the October issue of Cooking Light, I knew I was going to make it. I love braises and this one had all the flavors that I love! It’s so easy. First of all, can we talk braising pans? A braising pan is just a shallow wide pan with a lid. I use a Le Creuset 3 1/2 Quart Braiser because I love heat retention of the cast iron, however, this stainless steel version from Tramontina would also work. While you are looking at braising pans, you should also check out my favorite braising cookbook: All About Braising by Molly Stevens. This is my go to braising book. Any time I am braising, I check this book first, for times, hints, and tips and recipes! While your chicken is braising in the oven, you can make something to serve it over if you’d like. I was planning on serving it over an herbed polenta that I was going to make in the Instant Pot, but I didn’t have enough polenta! So, I added polenta to the grocery list and went searching to what else I could use. I always have whole wheat couscous, which cooks up in just 5 minutes, so that was perfect. You could add a quick green salad, but honestly I didn’t. If you still have some end of season tomatoes, this Heirloom Tomato Salad would have been a lovely side salad. Also, some more tips for cooking this. The recipe calls for 24 Castelvetrano olives – I found these at the olive bar in Whole Foods, any store that has an olive bar should be good. If not use a firm meaty green olive. 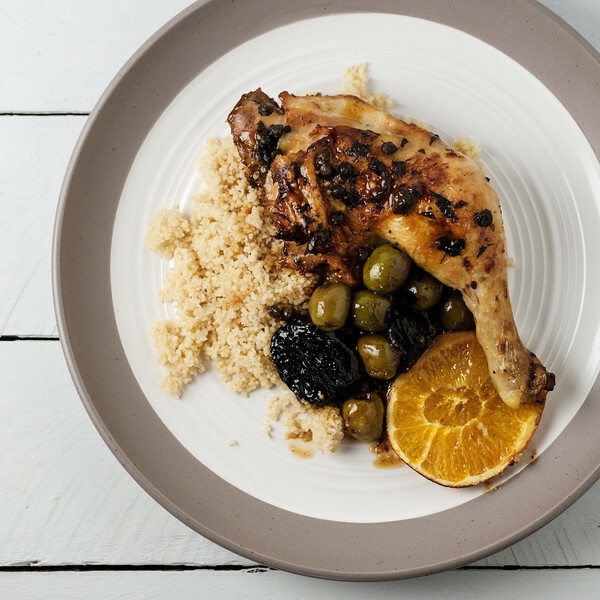 This Harissa Chicken with Olives is another easy weeknight dinner! 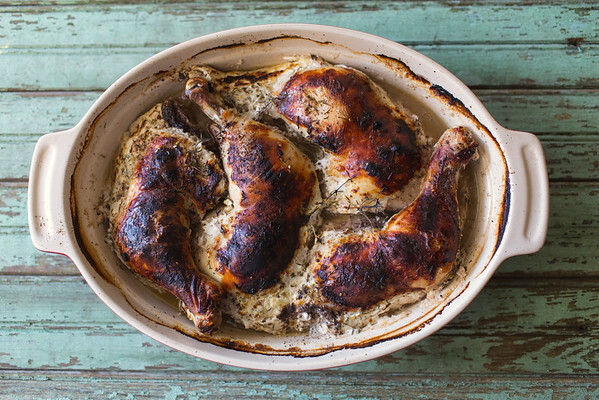 Buttermilk makes the chicken so tender in this Oven Braised Buttermilk Chicken! 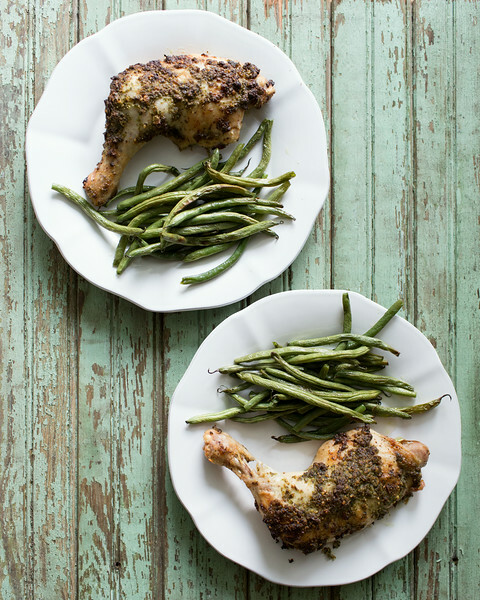 Chicken and tarragon are a match made in heaven in this Chicken with Fresh Tarragon Pesto. 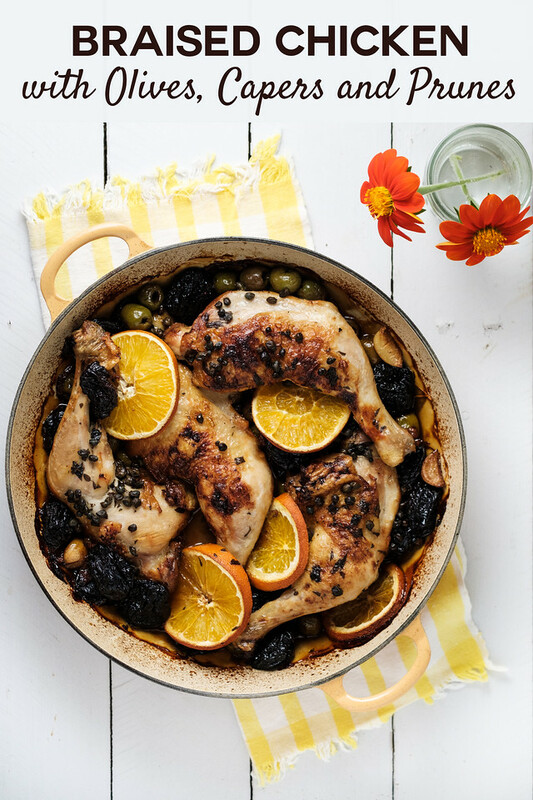 This Braised Chicken with Olives, Capers and Prunes will become a family favorite! In a small bowl, whisk together 1/4 cup of the olive oil, vinegar, capers, oregano, honey and 1/4 teaspoon salt. Set aside. Heat 1 tablespoon olive oil in a Dutch oven or braising pan over medium-high heat. Sprinkle the chicken with salt and pepper. Cook chicken meaty side down for about 6-7 minutes or until well browned. Don't crowd the pan, work in batches if you need to. Remove the chicken and set aside. Add the garlic to the pan and cook, stirring, for about 2 minutes until browned. Add the wine and bay leaves and cook until reduced by half, about 4 minutes. Stir in the olives and the prunes and nestle the chicken back into the pan. Pour the vinegar mixture over the top and tuck in the orange slices. Cover and bake for 40 minutes (45 if using whole chicken legs.) Uncover and bake for 10-15 minutes. Remove the bay leaf, sprinkle with fresh ground black pepper to serve. I tried this tonight as my first Instant Pot dinner. I followed all the directions, but instead of putting it in the over, I pressure cooked it on high for 20 minutes and then left the lid on for about an hour. It was awesome! Thank you! Oh, you are going to love your Instant Pot!! It’s from an old barn that was being torn down! This is perfect for a date night in!!! So much flavor! Oh, this looks so good! Love the flavors you incorporate in the dish and can’t wait to try! This looks like such a warm, cozy meal – perfect for a cool fall evening. Now, if only we’d have a cool fall evening! This looks like it has so much flavor! I heard Cooking Light won’t be in print anymore and will miss the magazine, although recipes will be online. I hate that they are stopping the magazine! I love it!